The sport of Cowboy Action Shooting has become hugely successful, with many events around the country drawing thousands of participants. 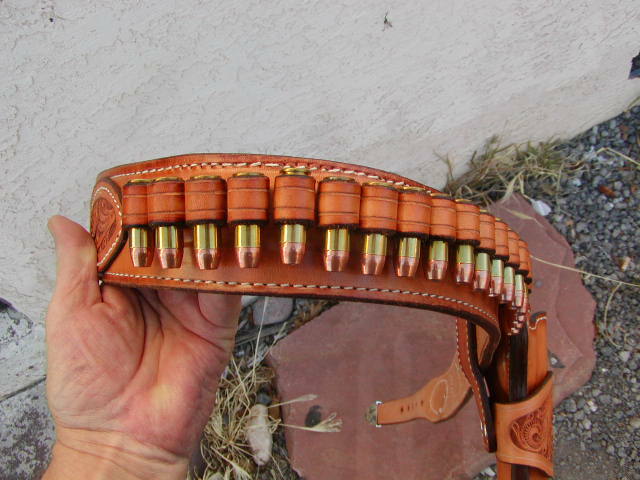 Also, lots of people just like the classic look of a nice western-style holster and belt, and Ray regularly receive requests for this style of carry rig. While working on designs throughout most of 2013 and 2014 Ray had researched some of the historically-correct styles and also corresponded wih a number of customers about their preferences. 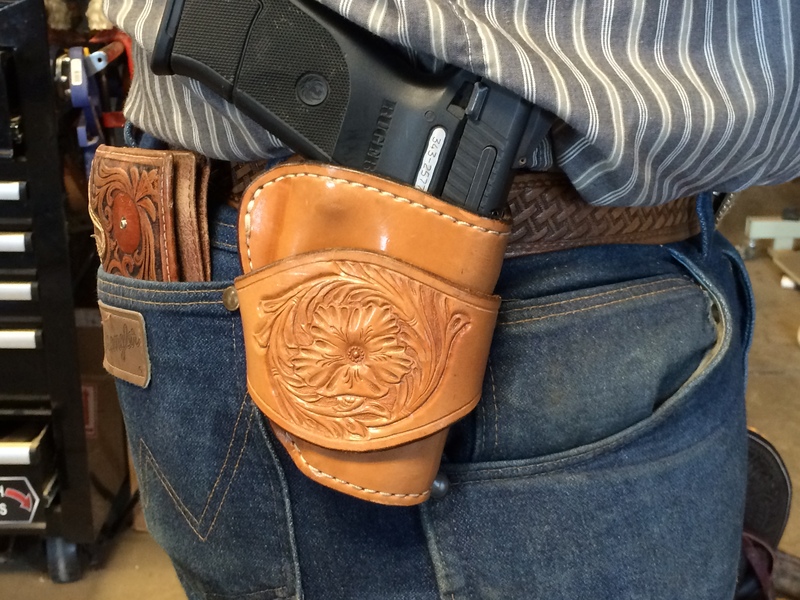 There are dozens of approaches that can be taken to this holster style. 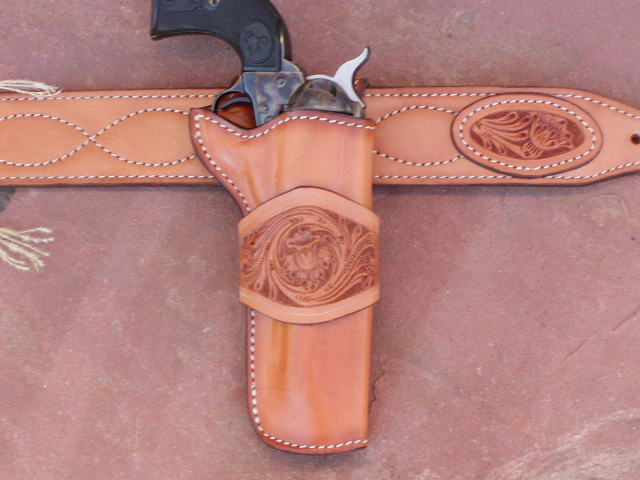 What Ray settled on is a holster inspired by the one used by John Wayne in many of his later films. Basically a Mexican single-loop design with mid-ride height. Working in this direction Ray found that the basic design offered some unique possibilities. In addition to the single-loop style the same basic holster could be outfitted as a Texas jockstrap style, and with appropriate construction methods the different loop styles can be interchangeable, allowing each customer a choice as well as the ability to order a second holster loop and change out the holster style anytime. Ray worked originally on a holster body of heavy leather lined with smooth soft leather Then while completing the Combat Classic design Ray became convinced that the two-layer holster body was the best way to obtain the strength and durability needed in the western style holsters. This two-layer holster body provides a smooth interior, eliminating any requirement for holster lining. We are now ready to start producing these to order for the Colt Single Action Army (and close clones), Ruger New Model Vaquero, Ruger New Model Blackhawk, several double-action revolvers by S&W, Colt, and Ruger, as well as a "Wild Bunch" variant for the medium to large semi-auto pistols. Holster only, single-loop or Texas jockstrap loop, base price (plain, uncarved), $95.00. Extra holster loop (single-loop or jockstrap style) when ordered with the holster, plain, $25.00. Belt (two-layer construction, 2.25 width tapered to 1.5" at the front for comfort, plain, uncarved, clip-corner buckle standard), $100.00, to size 50" (larger sizes at added cost). 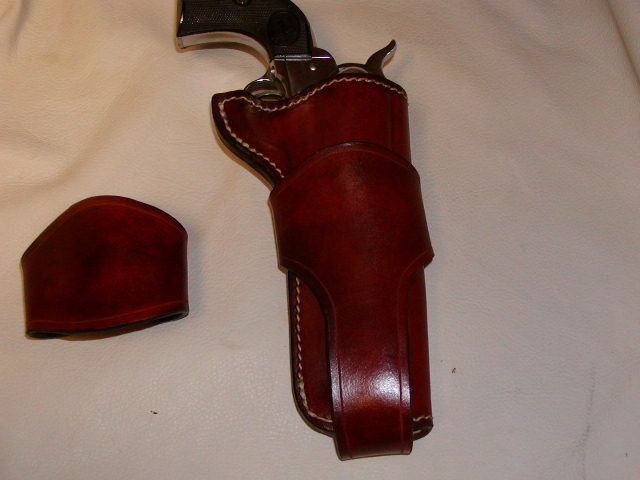 Hand-carved holster single-loop, add $40.00. Hand-carved holster jockstrap-loop, add $50.00. Cartridge loops (caliber .38-357, .44, .45), 6 for $20.00, 12 for $30.00, 18 for $40.00. Belt, fancy 'lazy stitch' pattern stitching, add $25.00.